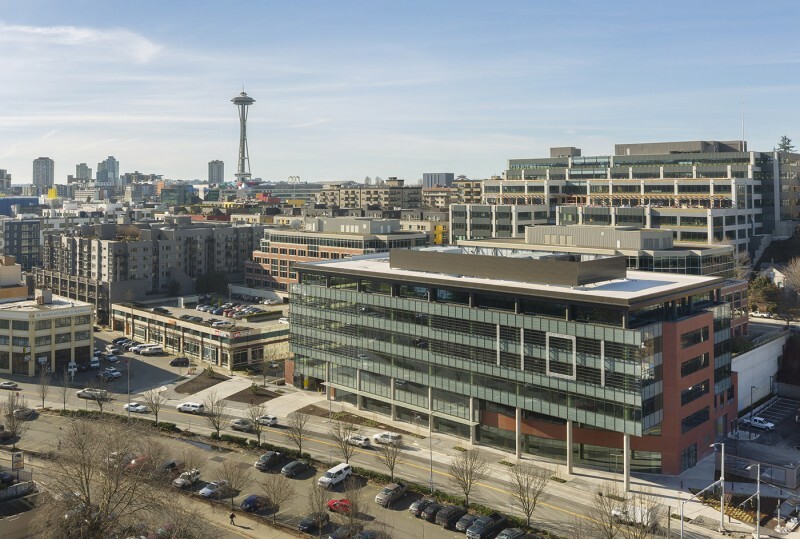 1101 Westlake, an office building in the South Lake Union neighborhood, was completed this month. An entity related to Invesco bought the six-story building at1101 Westlake Ave. N. for $67.4 million last year while it was under construction. The seller was an entity related to Holland Partner Group, which developed and built the project. MG2 was the architect. The building has 143,600 square feet of office space, 6,400 square feet of retail and 155 parking stalls. The team is targeting LEED silver. None of the office space is leased, according to OfficeSpace.com. MG2 said the design creates an efficient, flexible work environment. The lobby has a “living room” with adaptable space for work and meetings. Views of Lake Union are visible from all floors. MG2 worked with Christine Chaney on interiors. Other team members are DCI Engineers, structural; McKinstry, mechanical engineer; Prime Electric, electrical; Coughlin Porter Lundeen, civil engineer; and BCRA, landscape architect. MG2 has a number of local projects under construction and on the boards. Tower 12, a 34-story, 314-unit apartment building at Second and Virginia is slated for completion in May 2017. It will have an outdoor terrace and barbecue area, lounge and game room, media center, conference room and exercise facilities. Altitude Hotel & Residences, a 50-story hotel and housing tower at Fifth and Stewart, will have a sky hotel lobby, rooftop bar, retail and a sidewalk cafe. MG2 said the project will begin final design review this summer. The 347-room Hyatt Regency Lake Washington in Renton, which is part of Seco Development’s Southport mixed-use complex, is set to be done in spring 2017.